We love great ideas and when accessories become motorised we get very excited indeed, we would like you to meet the KUBI tablet stand. This news is a few days old now but we want to provide you with all the details and the latest update. 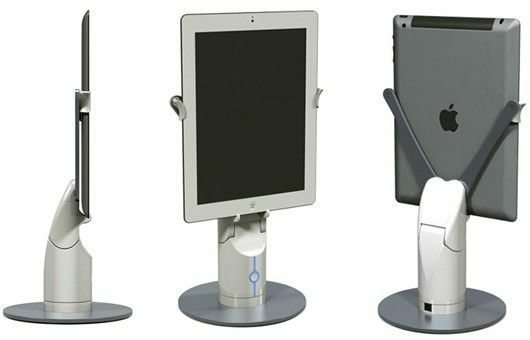 The KUBI telepresence robot tablet stand is perfect for iPad and iPad mini and just about any other tablet that is sized between 7.9 to 10.6-inches. 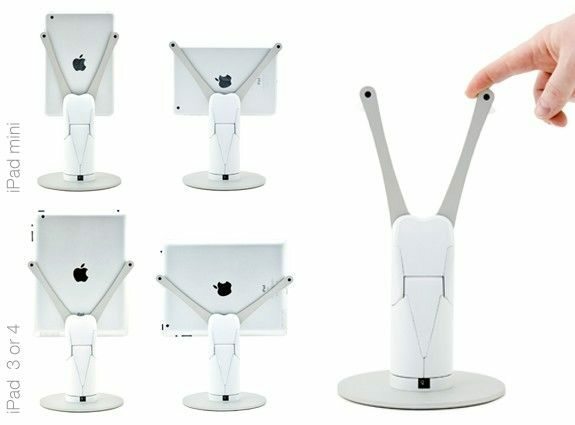 KUBI is a stunning desktop stand that is remote controlled for tablets, it allows the user to have hands-free video calls that can be controlled via the tablets camera anywhere in the world. You can use the likes of FaceTime or Skype and when in a video chat you can control KUBI using a web app with fully integrated controls, thanks to Telepresence all this is possible. KUBI the motorized tablet stand comes with a free integrated app for full control that can be used on your smartphone using the KUBI Kontroller website, you do not need any cables at all because it works via Bluetooth, it uses a grid interface to control motion. We say that it is perfect for the iPad and iPad mini because they both feature FaceTime, but the KUBI stand is also great for other tablets such as the Nexus 7, Microsoft Surface and any other tablet that has a screen size between 7.9″ to 10.6″. It features Smooth motion of 300â° pan and 90â° tilt driven by precision servo motors, it is wall powered or can use the on-board battery for approximately 4hrs of use, will not interfere with other Bluetooth audio devices and comes with Open motion control API, compatible with any OS – anyone can create new applications. Just one more thing, there is a special Hacker Kit for developers that will be released February 2013, this will include structural and mounting pieces, servos, assembly hardware, circuit boards and power adapter. The mounts on this kit will only fit the iPad 3 and 4 in portrait mode. This was a project showing on Indiegogo where funding was needed, the goal was to reach $100,000, well we visited the campaign site and it has only reached $29,952 and that the goal for this campaign received all of the funds contributed by Thu 17 Jan. They updated the site reporting that they received a $50,000 contribution and that they are now 77% of the way there, if this is the case why does the site say there is no time left? Anyway, when the KUBI stand goes into production they will cost $199, would you like to have one? Please watch the video below, very exciting stuff.